AVALON Hollywood is excited to announce yet another bass-filled CONTROL Friday! 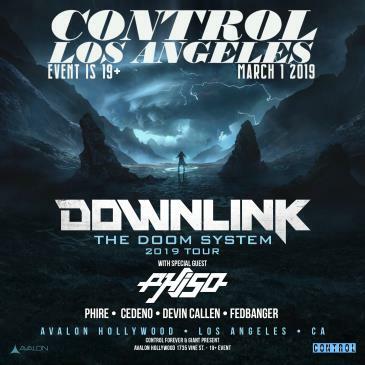 For this edition on Friday, March 1st, renowned Dubstep producer and DJ Downlink with support from Phiso will stop by as part of The Doom System Tour. Hailing from Canada, Downlink is a staple within the Dubstep community. His grimy and heavy bass sound has been described as “vile” and “adrenaline-fueled.” He is known for his outstanding performance quality, which includes live mixing with four decks, a high energy vibe, and an unforgettable, attention-grabbing stage presence. He has been featured on Rottun Recordings, OWSLA, and even Mau5trap, but has recently even pioneered his own record label-- titled Uplink Audio -- to feature his own music and make way for up and coming dubstep producers. Also from Canada, Dubstep producer and DJ Phiso landed on the public radar with his extremely popular release, “Jotaro.” It immediately blew up and was being played by some of the biggest names in Dubstep. After taking time to figure out how he could top this single that made anthem status, Phiso released a four-track EP titled “Disrespect” last October. The EP is known for its attention to detail, complete with high buildups, intense drops, and twisted basslines. Join us at AVALON Hollywood to experience the incredible talent of Downlink and Phiso on Friday, March 1st! Grab your tickets soon, you definitely don’t want to miss this night full of innovative dubstep.